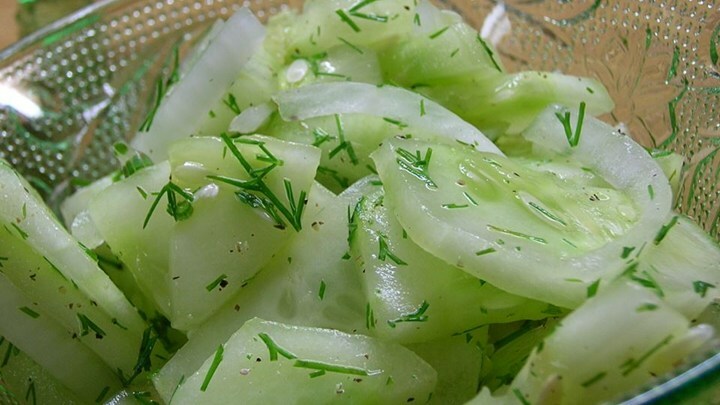 In a large serving bowl, combine cucumbers, onions and dill. In a medium size bowl combine sugar*, vinegar, water and salt; stir until the sugar dissolves. Pour the liquid mixture over the cucumber mixture. Cover and refrigerate at least 2 hours before serving (the longer this dish marinates the tastier it is!). *Don’t add the entire cup of sugar. Some do not like their cucumber salad too sweet. Give it a taste test first. If it’s not sweet enough, keep adding the sugar to taste.